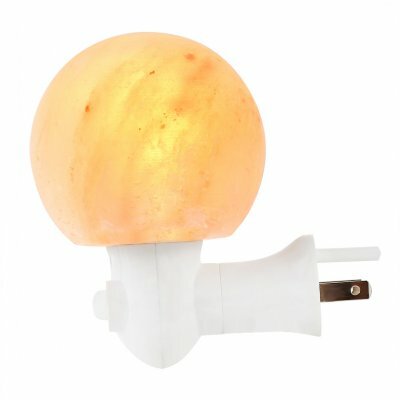 Successfully Added YRLED 15W Mini Salt Lamp Natural Crystal Night Light to your Shopping Cart. Specially Material: Salt lamp is made from natural Himalayan salt crystals which is hand mined in the Himalayan mountains. Air Purifier: Heating the salt with the included 15 Watt bulb, then it releases negative ions into the air, creating an effect similar to an ionizer, purifying the surrounding air. Cordless and Space-saving: Plug directly into the socket or the wall socket with no cords. No worries that people will be tripped over in the night. Bulb Replaceable: The salt can be easy taken off. Then you can replace the bulb. Create a Unique Ambiance: nice warm glow, perfect as a night light for kid’s bedroom, living room, porch, path, corridor, aisle. Increase the flow of oxygen to the brain. Decreased drowsiness and more mental energy. Protest against germs in the air. Decreased throat irritation by inhaling various particles which make you sneeze, cough. trouble. But Negative ions created by salt lamps will neutralize positive ions (they bond together) and help cleanse the air. 1, Sooth pollutants: Salt lamps can attract water vapor in the air that carry things like mold, bacteria, and allergens to its surface and removes them from the air. 2, Great night light: Offer a warm orange glow, similar to the hues found in a campfire or by candlelight, which make you sleep better. 3, Improve air quality: Attract pollutants in the air and even help neutralize the effects of electronics. the certain amounts of negative ions may also be helpful in boosting mood as well.